For this post, I’m focusing on the kind of play that is becoming seamless with our modern lives. Playing on our phones. Got a few minutes to kill? Play with some colourful Apps on your phone and then later, take that fun and apply it to your stash. 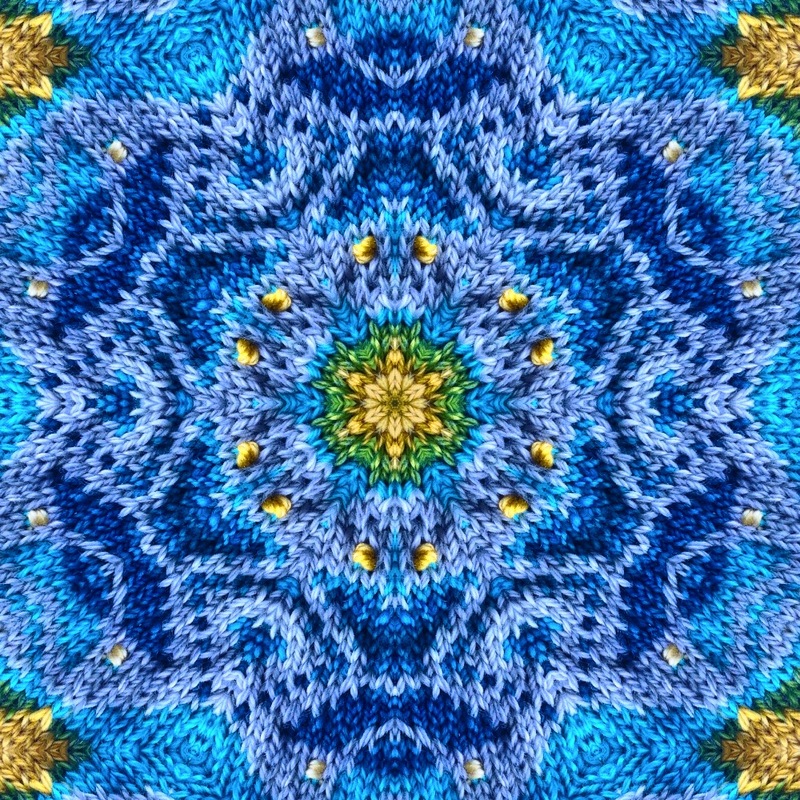 Two of my favourite apps for playing with Fair Isle colour ideas are Kaleidomatic and Adobe Kuler (or Adobe Kuler for your desktop). I will demonstrate how I use Kuler in my next post; today I’ll show you some of my fun in Kaleidomatic. Here’s how Kaleidomatic works. 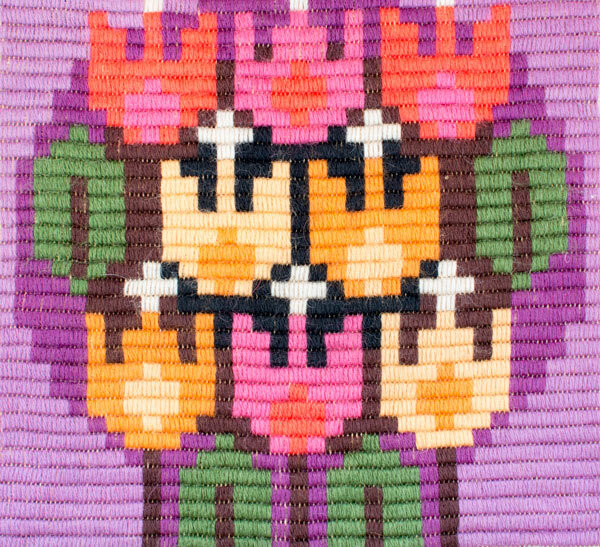 I took a picture of this 1970’s Swedish embroidery. (My house is filled with textile inspiration. If someone hand-made a thing, I find it hard to resist buying in a market.) Pop it into the app. 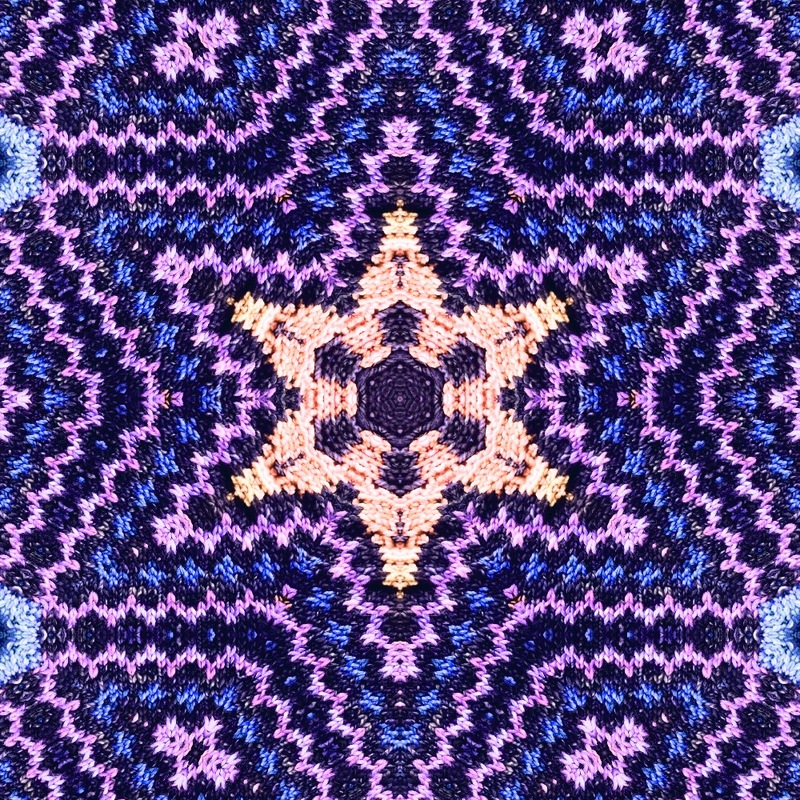 The app has a number of different filters which put the pattern into kaleidoscopic repeat, like the one at the top of the post. 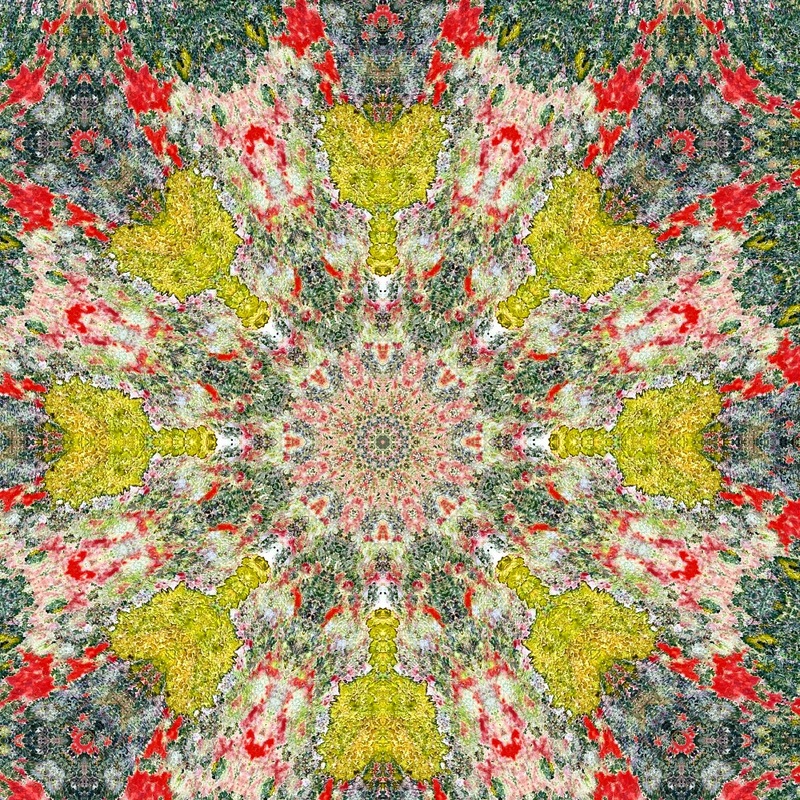 Some of the kaleidoscopic repeats look so much like fair isle tam tops. Even more so, when you feed segments of fair isle examples in. This is a chevron edging sample, disguised as a tam top in Kaleidomatic. This a a lichen encrusted concrete trash container on an estate near my home. Can you believe how vibrant it is? 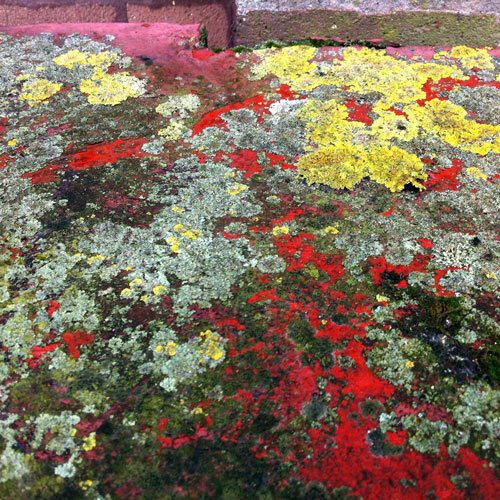 This is a kaleidomatic repeat of the colourful lichen. It gets me very excited about the colour possibilities in a lovely shetland wool. I could go on showing you examples from my photo library, but I think you’ll have more fun playing with it yourself. Let me know what you discover. 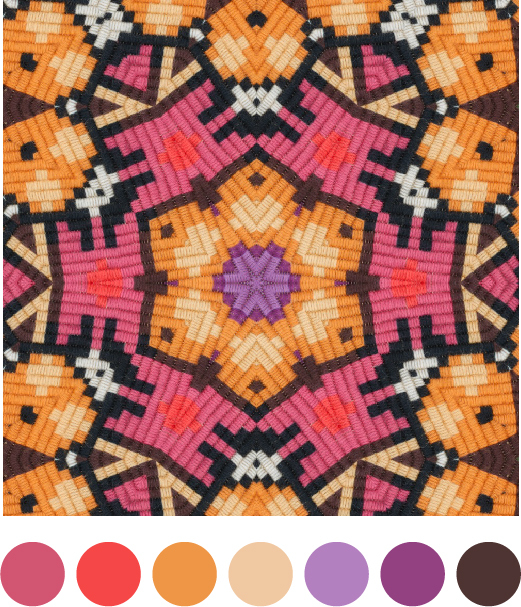 Next post, I’ll show you how I choose a colour palette based on my Kaleidomatic pictures.